One of the common characterizations of the Batman these past few decades is that he keeps allies and friends at arm’s length. This is driven by a desire to keep them away from the conflicts that he deals with on a daily basis, and also because the character sees these connections as vulnerabilities. 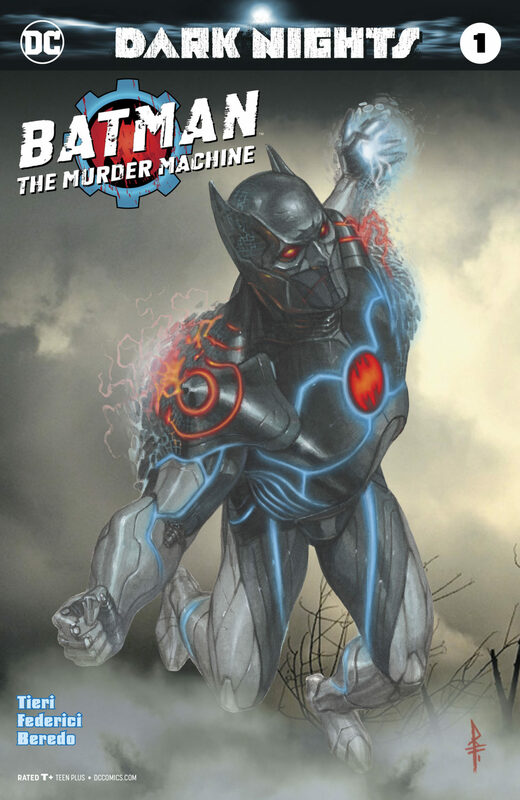 Batman: The Murder Machine is refreshing since we get to see this portrayal of the Batman reaching its tragic conclusion. The comic provides a flashback to the alternate reality Batman’s butler, Alfred Pennyworth, being tortured and ultimately murdered by a group consisting of Batman’s rogues gallery (Harley Quinn, Killer Croc, Bane, Two-Face, and others.) The Batman, after watching the tape of the murder over and over, breaks down and asks the half-man/half-machine superhero Cyborg for help in creating an Artificial Intelligence based on Alfred Pennyworth. Bruce’s attachment to the AI that simulates his butler becomes his undoing. Instead of deactivating the AI, he lets it back inside his subterranean headquarters, the Batcave, in the belief that it can be rendered harmless but without destroying the AI. Instead, the Alfred Protocol attached itself to Bruce Wayne and “fixed” him by removing all emotions. A cold, emotionless Batman now stalked his parallel universe world and killed everyone (including Bruce’s former allies and friends), the machines converting everything sentient into copies of itself. On the face of it, this looks a little like Marvel Comics’ very bleak Age of Ultron dystopian storyline, written by Brian Michael Bendis, from a few years ago. But the story very much taps into the prevailing zeitgeist of the potential and perils of artificial intelligence. However, as made apparent in Batman: The Red Death (which we have reviewed before), this Batman’s universe is destined to be culled. Batman’s newfound powers are unable to do anything (in fact, it was implied that the event that led to his new powers is considered by the Universe as wrong, and the main reason why his reality has to be erased.) This further leads to the demon called Barbatos stepping in and manipulating this Batman into invading other realities, rallying against fate and seeking a replacement for the world they lost. When we reviewed Batman: The Red Death, we criticized the comic for being an exercise in redundancy. That comic does not provide any plot or story element that could not have been tackled in a panel or two in the main series. This is not the case with Batman: The Murder Machine. This new tie-in provides a story that stands on its own, being largely emancipated from Dark Nights: Metal’s storyline. It can be enjoyed even by people who do not care about the main series. The broader, philosophical question underpinning the story is relevant irrespective of whether the reader is familiar with Batman or not: will we all end up as Alfred Pennyworths, endlessly lethal and ever-polite?